(By Imtiaz Ullah) It would be wrong to say that we have never fantasized about sitting under the sun while caressing our fingers through the white powdery sand and gazing at the various shades of the sea. This is the recipe for a perfect beach stay- the dose of sand, sun and sea which adds to the mystic aura. But it’s not only the beaches that will inspire someone in travelling to Thailand. Thailand is much more than its beaches. Thailand boasts of lush green amazon-like jungles, amazing food, world class diving spots and above all, a composite culture. Thailand also satisfies tourists who would like to indulge in shopping. It has a vast plethora of shopping options. The people here are ever welcoming and will never shy away from a smile. They make you feel at home. When you are tired of travelling, rejuvenate the muscles by settling into any of the wide variety of spas that this place has to offer. 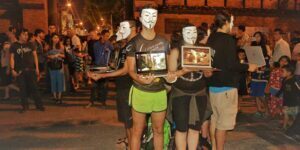 Thailand combines tropical goodness with an insane party atmosphere, an inherently liberal outlook and thus, becoming a perfect travel destination. Kanchanaburi: Kanchanaburi is the third biggest province in Thailand with mostly mountains and hilly terrains. 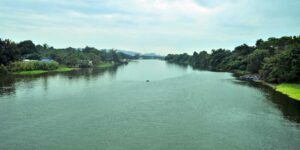 Important rivers are the Kwai Yai and the Kwai Noi which merges at the Mae Klong River. Distance: Bangkok- Kanchanaburi: 130 km (3 hours). How we travelled to Kanchanaburi from Bangkok: There are air-conditioned and non-air-conditioned buses running the routes of Bangkok–Kanchanaburi and Bangkok–Three Pagodas Pass from the Bangkok Bus Terminal (Southern Line) every day. The journey takes around two hours. For more information, call 1490 or visit www.transport.co.th. Online ticket booking is also available on www.busticket.in.th, www.thaiticketmajor.com and www.thairoute.com. A tourist train to Kanchanaburi is provided at Thonburi Railway Station in Bangkok. The first impression of Kanchanaburi is of a place which is laid back and everything seems to be moving at a languid pace. This place has a strong historical significance. The walls whispers tales of courage. The rich saga of beauty reflects in the artwork. Kanchanaburi offers a variety of oriental food options ranging from crocodile meat, insects, sticky rice with mango to duck meat cooked in authentic Thai style. This place can be a gastronomical delight for food lovers. The town of Kanchanaburi largely remains off the main tourist map of Thailand but we found this place to be a hidden gem. 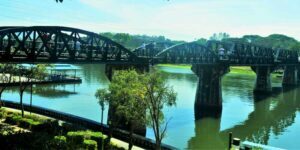 The Bridge over the River Kwai: The Anglo-American movie “The Bridge over the river Kwai”, helped this place gained popularity. Though not the most beautiful bridge in the world but the tragic history of the place makes this place special and worth visiting. The construction of the bridge started in 1942 under the supervision of the Japanese. The periphery area of the bridge is the only place around Kanchanaburi that would feel touristy with markets all around, lots of street foods and money changer kiosks. It is mostly frequented by backpackers and the local thai people. Hence, the cost of accomodation and food is on the lower end. 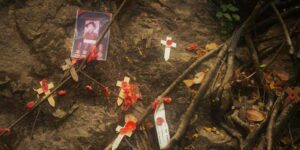 Memories of the world war 2 in the HellFire memorial. Hellfire Pass: We did a day trip to Hellfire Pass by a taxi. It took us around 90 minutes to reach. The Hellfire Pass museum has great memorial significance. The museum houses weapons used during the war, interesting exhibits and quality audio tours that would keep you engaged. Once you enter the museum, footwear should be removed as a mark of respect. The eponymous Hellfire pass is around one hour walk down the trail. The walk is through a beautiful valley with mostly bamboo trees on either side. The trail has been created by partially clearing the trees. Audio guides are available at the museum and as we walk, we can listen to accounts provided by the POWs who worked at the railroads. This proves to be very informative and adds context during the walk. We also came across lots of markers, memorials, remains of rusted equipments and train parts during the walk. The hike is not difficult but walking back up the stairs of the museum was somewhat challenging and consumed energy. It is advisable to wear a comfortable trek-ready/ sports shoes and carry sufficient water in order to quench your thirst. Once the walk is completed, there is a small cafe nearby catering a wide variety of coffee. I sat in the cafe, sipping coffee and striking up a conversation with the owner who was very hospitable and also played with their kid. Death Railway: About 20 minutes walk down the river from Helfire Pass is Nam Tok. This is the last functional station on the Thailand-Burma highway.There is a cave near the station which is a must visit. The view from the railway track on the hill presents a breathtaking view of the river. The glittering lights from the house boats added a magical touch to the entire valley. The sunset here should not be missed at any cost. the three-headed white elephant of Hindu mythology. The top tier of the falls resembles an elephant’s head. The Park is open for visitors from 8 AM to 4:30 PM everyday, throughout the year. Although the official closing time is 4:30 PM, rangers start cleaning from the top tier around 3 and asks visitors to leave as they slowly move down tier by tier. The lower tiers could be open until 5 PM and depends on how quickly/ slow the cleaning goes. The park is generally very busy during the weekends and public holidays. River Kwai Boat Tour: The boat tour in Kwai river commences from a very scenic and secluded place. As the raft sails through at a slow pace, we witnessed lush green tropical forest on either side as well as the mountains of Sai Yok. We stayed at the River Kwai Bridge Resort (www.riverkwaibridgeresort.com). The resort provides you with the perfect surroundings to feed the enchanting beauty of the River Kwai. Chiang Mai is the second largest city after Bangkok and the most culturally significant city of Northern Thailand. It is the main base for activities for most travelers who chooses to come up north. 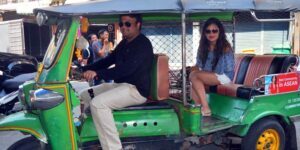 How we travelled to Chiang Mai from Kanchanaburi: There is a VIP bus service from Kanchanaburi bus station to Chiang Mai. For booking, one can contact – 092 724 7460 or 094 616 6925. The bus leaves Kanchanaburi at 9 AM and 7 PM (Leaves Chiang Mai to reach Kanchanaburi at 7:30 AM and 8 PM). It is supposed to take about 10 hours. It makes a half an hour stoppage for lunch/ dinner about half way through the journey. Things to do: Take A Walk – Pick up a Chiang Mai city map or dare to get lost! You can easily walk inside of the wall of the old city as there is little traffic and you will discover some beautiful hidden gems of Chiang Mai. I met many Indian vendors here specially from Kashmir selling pashmina shawls and handicrafts. When they came to know that I was from India, they were very happy and invited me for tea. Doi Inthanon National Park: Doi Inthanon (2565 m) is the highest mountain in Thailand. Doi Inthanon National Park is an interesting home to diversity. It is home to rainforests, mixed forests and pine forests. The weather is cool throughout the year, especially in the colder season when there will be constant fog coverage almost throughout the day and a stunning view. Pay homage to Phramahathat Napamathanidol and Phramahathat Napaphol Bhumisiri (the Great Holy Relics Pagodas). Savor the beauty of mystical morning winter mist. Explore the Mae Klang, Wachirathan, Siriphum, Mae Ya waterfalls and Kew Mae Pan and Ang Ka nature trails and Mae Klang Luang Rice Terraces. 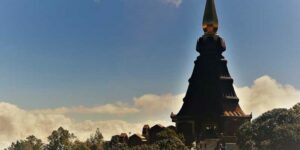 Wat Phra That Doi Suthep and its 304 Steps: Wat Phra That Doi Suthep perched high on the flank of Suthep Mountain is Chiang Mai’s most famous temple. The pagoda in the center supposedly contains some relics of Lord Buddha. Entrance fee is 30 THB (Thai Baht). It’s open from 6 AM-6 PM. 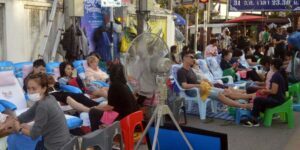 The Saturday Walking Street: It seems a bit more local and runs just south outside the Old City on Wua Lai Road. Then there is also the Night Bazaar which is open every day from sunset until midnight. Here you will also find the Ladyboy Cabaret show, one of the greatest spectacle and unlike any other shows around Thailand. Get clicked with these ladies, they are super friendly. Thai Massage: There are many spas to relax and unwind, after all the action and adventuring. A rather interesting massage can be found at the Chiang Mai Women’s Correctional Institution which offers a program that trains inmates on Thai massage in order to help the women gain employment and integrate them back into the society. Food: Try Pad Thai, Tom Yam, the northern-style Thai salad, fresh spring rolls, chicken skewers with peanut or spicy papaya salad. Don’t miss out on my favorite mango sticky rice! We stayed at the Raming Lodge & Spa (www.raminglodge.com). Situated on Loi Kroh Road near the Night Bazaar, Raming Lodge offers guests with wide range of convenient facilities including spacious parking lot, Raming international cuisines, a comfortable outdoor pool, Supaya Spa, traditional Thai Massage and Tour Service Desk. If you are a beach bum, love the oceans and like to get tanned, then its high time you pack your bags and hit the picture perfect tropical islands of Thailand. The million dollar question that a traveller encounters is to choose the best of the islands out of the hundreds of amazing islands. Time being of essence here, after much research I decided to cover Railay beach, Krabi and Maenam beach and Koh- Samui which are some of the most breathtaking and pristine beaches. However, this isn’t an exhaustive list of the islands in Thailand. There are many other pristine and beautiful islands, however, the islands highlighted are to my preference. Taxi-Fly-Van-Boat: Taxi from hotel to Chiang Mai Airport, fly to Bangkok. The cheapest way from Bangkok to Krabi is to fly out of Don Mueang Airport (DMK) in Northern Bangkok to Krabi. Once you arrive at the Krabi Airport take a taxi/ van to Ao Nang pier. From Ao Nang pier, board a long boat to West Railay Beach. On reaching West Railay, walk to your accommodation as there are no vehicles and everything is in close proximity. Alternatively, you can also request the hotel for transfer from Krabi airport to Railay Beach. Railay Beach(Krabi): It’s difficult to describe the beauty of Railay beach in mere words; it’s the feeling that stayed with me. The island is isolated from the mainland by limestone cliffs standing precariously since time immemorial. Adding to the beauty is the green flora decorating the mountains which lends a green hue to the water. It feels as though you have been deported to a seductively nestled beach. Railay sits on a peninsula between the busy tourist centers of Krabi and Ao Nang . The four interconnected beaches that makes up Railay are: West Railay, East Railay, Phra Nang and Tonsai . These islands are secluded from the hustle and bustle of Ao Nang and a perfect place to relax. The Railey Island lends a distinctly bohemian, easy-going vibe to the travellers. Railay West offers perfectly soft sand, a wide beach, informal beach restaurants and friendly locals. The beach faces west, so you can catch a beautiful glimpse of the sunset from the West Coast. There are a few trips that will heighten the sunset experience such as a Sunset Cocktail Cruise, Krabi River Cruise, or Sunset Kayaking. Indeed, watching the sunset from any of the points will put a big smile on your face as you gaze into the tropical horizon. A pathway straight across the peninsula links Railay West with Railay East. You can also walk along the beach at Railay East and along the base of the cliffs to Phra Nang beach (about 45 minutes). Railay Beach East, a narrow beach on the opposite side of Railay West, is home to mangroves, local fishing boats and local birds. It’s also the most convenient place to find a longtail taxi boat to Krabi town and other beaches. A few local restaurants line the beach, providing welcome shade and a drink while you wait for your boat. At night, they form the focal point of the Railay High season party scene with bars like Gecko, Cliffs, Railay Experience and the Last Bar. Eating At Railay: Railay East is effervescent with restaurants and bars along the beaches. It has numerous small eating places around the resorts or beach areas, serving both Western and Thai seafood. Not all of the restaurants in Railay West serves alcohol, but a great selections of fresh juices are available. Nightlife is fairly low key with the party scene (mainly high season) located in Railay East. The Last Bar restaurant plays some cool jazz music that keeps the travellers entertained and is the perfect place to witness some intriguing fire shows. Rock Climbing: The craggy limestone formations of East Railay make it one of Thailand’s top rock-climbing destinations with safety bolts and marked-routes covering much of the cliffy area. While advanced climbers will find plenty of challenges at Railay Beach , new climbers can register for “top rope” climbing classes to learn the sport with added safety measures. Happy Island Hopping: Krabi is the gateway to the gorgeous Andaman Island. With plenty of islands in the vicinity, choosing the right islands to explore can be an overwhelming and daunting task. The myriad of islands have attracted scores of travellers to these beautiful islands. 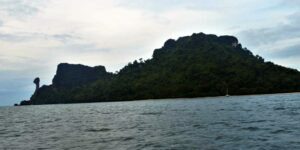 During our stay of two days in Railey, we have covered the following islands in a Longtail boat . Alternatively, you can also opt for 4 Island tour. The booking can be done from any of the resorts. Chicken Island: Originally named Koh Hua Guan (“Axe Island”), this island was later nicknamed Chicken Island by tourists because of the chicken-shaped rock at its southern tip. This island is visited mostly by travellers for a short duration and take photos of the unique chicken head. Koh Phi Phi Island: An island that never sleeps. The movie ‘The Beach’ was filmed here in 1999 and subsequently, this island found its place in most of the travellers bucket list. With a bustling nightlife and crowded beach parties that extend all night long, Phi Phi Island became an epicurean paradise. water is of a vibrant green-turquoise color unlike nothing I’ve ever seen. A paradise on Earth, that’s for sure! Phi Phi Don has one of the more intense vibes I’ve experienced in Thailand. Attracting a young and energetic ready-to-party crowd, it offers a lot to do from snorkeling boat trips to beach parties. Phi Phi Don is noisy and teeming with tourists but still I was in awe with this beautiful marvel of nature. We stayed at the Railay Bay Resorts & Spa (www.krabi-railaybay.com). The resort is set in lush gardens stretching from west to east Railay with plenty of coconut trees and tropical fauna placed between the bungalows and walkways to ensure that you will never find yourself in less than beautiful surroundings. 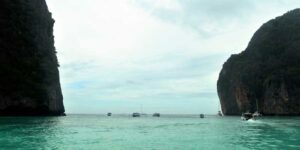 How we Travelled to Koh Samui: Railay to Ao Nang Pier by Long Tail Boat, Krabi to Koh Samui by Lomprayah High Speed Catamaran and Coach. Koh Samui: The Sleepy Magical Island, once the mecca for ‘backpackers’ has now has turned to a full fledged tourist hotspot. Koh Samui is a beautiful island off the south-eastern coast of Thailand. A day spent in exploring the spectacular and astonishingly diverse flora, and its dozy little neighborhoods inhabited by some amiable islanders is a pure serendipity. 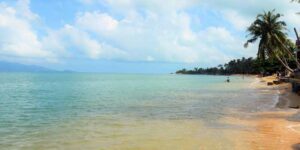 Chaweng, Lamai and Bo phut are the most popular beaches in Koh Samui. The bustling villages of Chaweng and Lamai have become home to many of the islands hotels, nightlife and shopping areas. Chaweng beach is the party destination in Koh Samui and the venue for all night entertainment activities of this island. If the late night parties have not worn you down, keep awake to witness a beautiful sunrise. We were in the last leg of our sojourn in Thailand and we were looking for a beautiful laidback beach to unwind ourselves. I was in no mood for something noisy. On the contrary I wanted to settle for the night, listening to some soothing live music with a glass of cold beer and my own good company. Seems really romantic, ain’t it? The answer to all these was: The Maenam Beach. Why I like the Maenam Beach: It’s aloof from the crowd and still at a striking proximity to the busier parts. This is what I call a perfect balance of serenity and convenience. 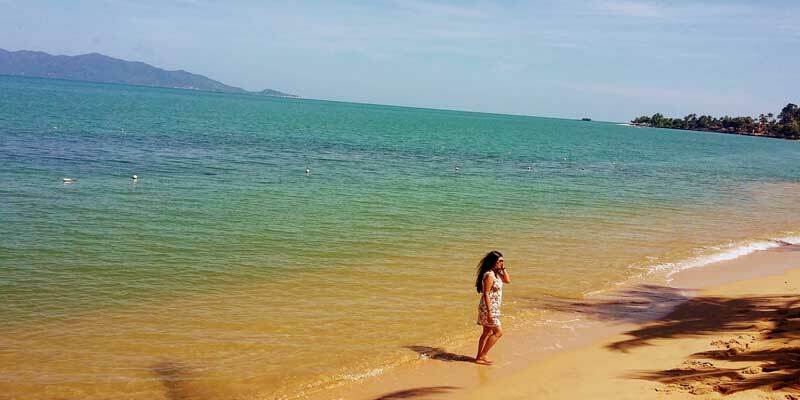 Gazing across the water to Ko Pha Ngan to the north, Maenam is the longest of the north-coast beaches in Koh Samui. For things to see and do, there’s a weekly walking street (Thursday nights), a few Thai temples and a Chinese temple. If you are interested in some Thai massage for relaxation, then head out to one of the many massage parlours in the beach. Most importantly, take a stroll in the white powdery sand of the beach and swim in the warm turquoise blue water of the sea. To witness the sunrise from this beach make sure to wake up before crack of the dawn. The tropical hues of blue come to light with the first rays of sun.We stayed at Paradise Beach Resort and Hotel (http://www.kosamui.com/pbr/) Paradise Beach Resort is set amongst lush tropical gardens and surrounded by dense coconut plantations. 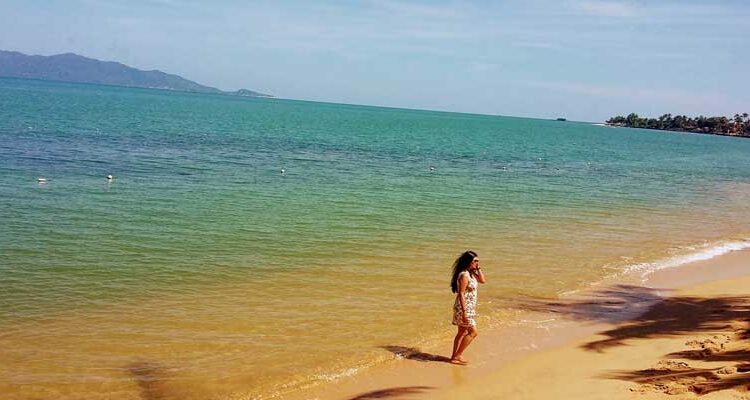 Located on Samui’s tranquil northern shoreline, it borders the non-commercialized golden sands of Maenam Beach and the warm clear waters of the Gulf of Thailand. Paradise Beach Resort is the perfect place for relaxation and an idyllic escape from a busy daily life. In a nutshell, I can conclude by saying that you would have to try real hard not to fall in love with this magical place. Thailand has something to offer to each and every type of traveller; the reason why every traveller adores this country in Southeast Asia. 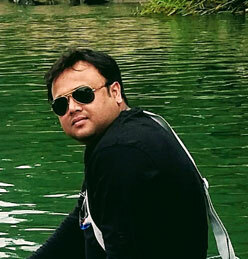 Imtiaz Ullah is a corporate attorney, an avid traveller and advisory member of NGO- Sarvahitey. He calls himself The Nomadic Attorney. He always believes in the idea-“Don’t just be a traveller but a Responsible one”. He is involved in various projects that aims at upliftment of the society and also promote responsible and volunteer tourism.